David Gilmour has just finished off the second leg of the Rattle That Lock tour. His playing and tone is already talked about among fans as among his best. In this feature weâ€™ll look at the recent evolution of Davidâ€™s rig and tone. Davidâ€™s new stage rig is a return to classic guitars and the exhausting array of stompboxes similar to what we saw in the 80s and 90s. Itâ€™s a surprising mixture of old and new that reveal a determination to really recreate the classic tones from the Floyd catalog and at the same time, exploring new sounds. The whole show is really about David finally realising himself as a solo artist, without the weight and pressure of Pink Floyd. While On an Island, and as much as I love that period, comes off as sort of forced and perhaps even unfulfilled, Rattle That Lock, and the tour, sees David in a much more relaxed fashion and not afraid to really bring out the big guns. Itâ€™s speculation of course but to me it is pretty obvious that Endless River was as much a closure as it was a tribute to Richard Wright. David now has the experience of On an Island and the freedom to do pretty much whatever he wants, without having the constant shadow of Pink Floyd hanging over him. Perhaps thatâ€™s also why Rattle That Lock sound less Floyd than On an Island. Rattle That Lock was recorded simultaneously with the extensive work and overdubs done to Endless River. It was a long and continuos session, which was also a first in Davidâ€™s brand new recording studio, Medina, located in Hove outside Brighton, UK. The studio feature a vast collection of guitars, amps, pedals and other instruments and provides David with an easy access versatility that he never had in Astoria. Itâ€™s no doubt that both he and not least Phil Taylor, Davidâ€™s long-time technician, got inspired to check out new gear and new ways of arranging and setting it all up. So, who tracks down all that stuff? Well, most of it is already in Davidâ€™s huge collection. He and Phil has been collecting guitars, amps and pedals since the mid 70s. Itâ€™s always been there but now they got the space for it. David might be very aware of what tones he wants but Phil is, and has always been, the one to realise those tones, the one who tracks down old and new gear and the one setting it up. They also get a lot of stuff sent to them as companies no doubt see the marketing value of David using their products. Davidâ€™s studio and stage rigs are also inspired by trends. Back in the 80s, it was all about new technology, which lured David down the path of guitar synths and digital effects. By 1994 and Division Bell, there was a return to the basics, much thanks to the grunge bands and the resurrection of analog pedals. Now, the trend is vintage guitars, amps and stompboxes. It is no longer frowned upon to use rotary cabs and flangers. Thank God! On an Island was a mellow, down to earth album. Like the music, Davidâ€™s tones are perhaps some of the smoothest heâ€™s ever recorded. To create that lush tone, they micâ€™ed each amp with two mics, one up close and one further away for ambience. David also used a lot of delay, to create space and long sustained notes. Heavy distortion was toned down and he also employed guitars and amps that fit in with the overall sound of the album. Rattle That Lock is very much the opposite of On an Island. As mentioned above, the album was recorded simultaneously with Endless River but while Davidâ€™s guitars on that album is unmistakably Floydish, with swirly rotary cabs and complex delay textures, Rattle That Lock is cleaner, straight to the point and much more modern sounding. – David’s new recording studio features a wide range of different amps, including the Yamaha RA200 rotating speaker cabinet. 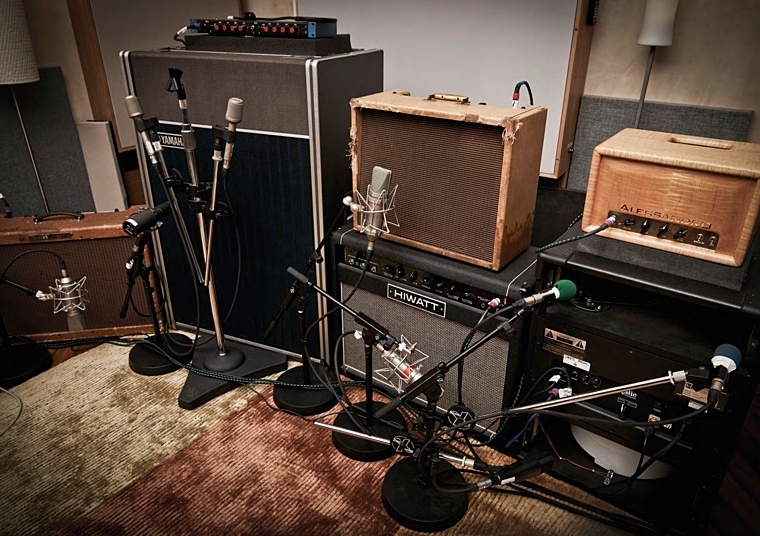 Each amp in Davidâ€™s new studio, is micâ€™ed with a Neuman U87 condenser microphone set fairly close to the grille. These mics has a bigger tone than the usual Shure SM57 but they also sound brighter, with emphasis on the upper mid range. The Black Strat and a couple of Telecasters, was favoured for the recording sessions. This, combined with clean amps and brighter sounding Tube Drivers and compressors, produce a tone thatâ€™s perhaps less warm and smooth compared to what weâ€™re used to coming from David, with a lot of presence around 2-2.5kHz. This is done to create a brighter, cleaner and poppier (in lack of a better word) sound. Songs like the title track and Today, has a more radio friendly production, which require a different approach tonewise. One can argue that On an Island or Endless River both feature a better sounding Gilmour but thatâ€™s kind of beside the point when you look at it from Davidâ€™s perspective. His goal with Rattle That Lock was to produce something different and if anything, David certainly show a lot more confidence and joy this time around. 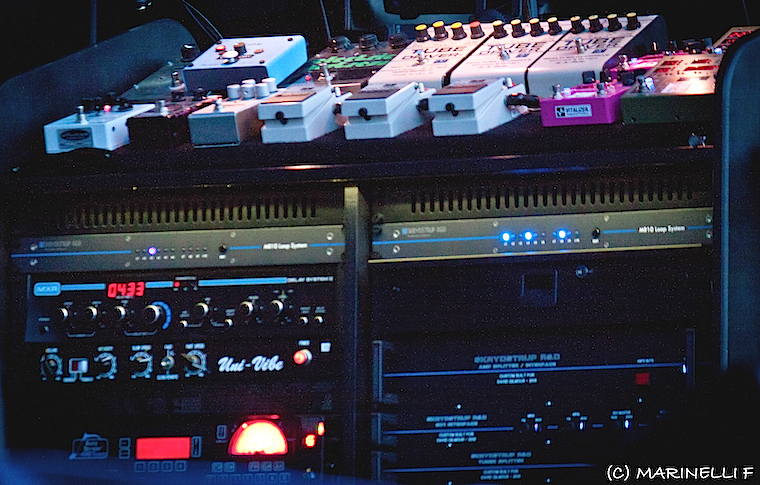 Read more about David Gilmourâ€™s Rattle That Lock studio rig here. Davidâ€™s current stage rig is a continuation of the studio setup. Heâ€™s no longer using his trusted Pete Cornish pedalboards but rather a large rack, with all the pedals laid out. Everything is routed through a Skrydstrup switching system, allowing an almost unlimited amount of presets and tones. Itâ€™s surprising perhaps, given that David seems to have favoured the Pete Cornish boards since early 2000s (and in the late 70s/early 80s). But, having everything in an easy access fashion allow David and Phil to test and try new pedals along the way, like they did during rehearsal and again prior to the South American leg, where they added a Sovtek Civil War Big Muff and switched the EQs around. 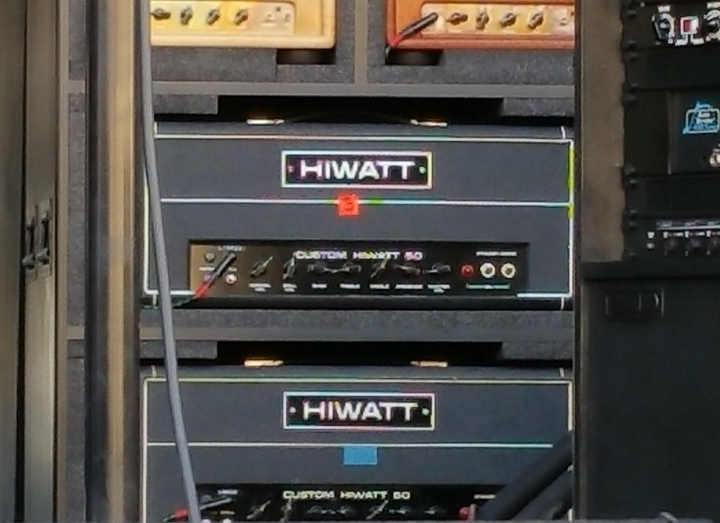 David Gilmourâ€™s stage effect rack. David’s Skrydstrup SC1 Midi Controller and XT+ extension moodule switcher board, as seen during the rehearsals for the tour. Note the Digitech WH-1 Whammy for The Blue. They can also fix any problems easily, without having to open up the Cornish board or possibly having to ship it back for maintenance. However, the amount and choice of effects is more or less constant. David has a palette he likes to work around and everything they change and introduce is within that tone family. So, does David really need all those pedals and effects? Not all at once, obviously. Most of the time, each section of a song (intro, verse, chorus, solo) only feature 2 or 3 effects but he clearly wants to replicate the classic tones for the Floyd songs and for that he needs different distortions, modulation and delays for authenticity. As fans, we donâ€™t expect any less. As on the album, Davidâ€™s favoured guitar is the Black Strat. It seems to have the same mods and features as in 2006 – nothing new is reported. Heâ€™s also using his â€™55 Fender Esquire, which is a first since the Wall tour in 1980-81 (not counting guest appearances). How cool is it to see those two guitars together again?! Thereâ€™s also the â€™56 Les Paul Goldtop, the Jedson slide and a selection of acoustic guitars. 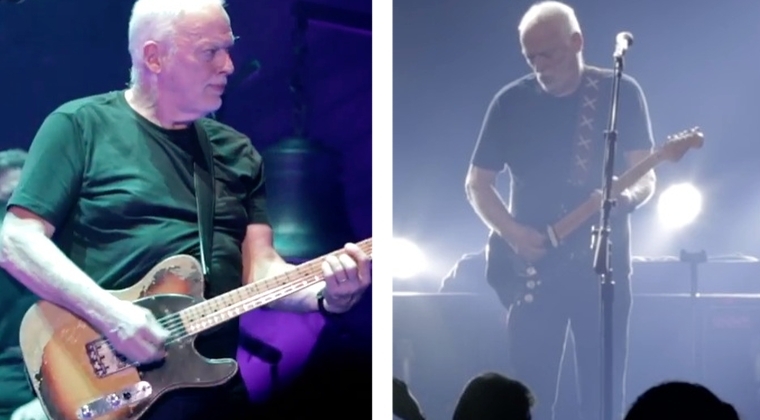 David pictured at Brighton Centre, Brighton, UK, September 5th 2015 with his two main guitars for the tour, the ’55 Fender Esquire and the Black Strat. David has mentioned, in recent interviews, that he wanted a slightly more aggressive tone for the tour. Perhaps thatâ€™s why heâ€™s now using Hiwatt Custom 50s, which is easier to control and drive, compared to his trusted old Custom 100s. The heads are set up with linked input, rolled back treble and a fairly high set pre-amp volume. This will produce a very warm and punchy tone at the very edge of breakup, which again creates a powerful basis for the pedals. The 50w Hiwatt heads will also match the two low wattage Alessandro heads (although they are very loud). The main setup for the show, is one Hiwatt head combined with one Alessandro head, with the other two heads as spare. The combo is close to what David used for the 1993 Division Bell recording sessions, with the Hiwatt providing presence and mid range and the Alessandro a pristine, bell-like clean tone. The setup feature three different compressors: Effectrode PC-2A, Demeter Compulator and a Slide Rig from Origin Effects. The latter seems to be assigned to the Jedson for slide, while the Effectrode and Demeter alternate in different patches for different applications based on their tone and characteristics. Although Davidâ€™s always been a fan of using compressor pedals, and perhaps more so than most guitarists, he now seem to favour compression over milder overdrive and having to stack overdrives and distortion for the right amount of sustain and balance. I assume this is part taste but it also allow a cleaner signal and less noise and feedback. Still, I think heâ€™s using too much compression and some of his tones are squeezed so hard that instead of being enhanced, they choke up and the attack sounds more like a â€œpopâ€ rather than a more musical â€œclickâ€. An example is the opening track on Rattle That Lock and the tour, 5am. I love his playing and phrasing but the tone is heavily compressed and it doesnâ€™t leave room for any dynamics. He could easily have achieved a similar but better tone, in my very humble opinion, with just the Goldtop into a Tube Driver, set for a hint of breakup. The solo on Time also seem to suffer from David being overly confident in his compressors and boosters. Rather than kicking in a heavy distortion (Tube Driver) or Big Muff, heâ€™s relying on compression and mild overdrive to produce those ethereal and sustained notes. It doesnâ€™t happen and he seem to struggle more than he should. There are three Tube Drivers in the rig. Each set with different settings – clean, overdrive and distortion. The clean Tube Driver acts more like an EQ, adding a bit of tone and â€œbodyâ€ to the otherwise fairly neutral sounding amps. Adding a compressor, will enhance the clean tone and provide sustain. Stacking a second, slightly dirtier Tube Driver on top of the first, produce a fatter sounding overdrive, with lots of character and harmonics, much like driving the front end of a tube amp. The setup also feature three EQs. These are set more or less identical, with a slight boost between 200-400Hz and a slight roll off in the higher mids, around 3kHz. Weâ€™re talking 2-3dB on each of these bands, at most, but the effect is just enough to make everything sound just a tad smoother and stick out a bit more in the band mix. A surprise perhaps is the fact that David doesnâ€™t seem to be stacking the Big Muff with an overdrive, like in previous years. On both Sorrow and Comfortably Numb, heâ€™s just using the ramâ€™s head Big Muff combined with one EQ and delay. The rig feature no less than five delay units: 2 Providence Chrono Delays, 2 Free The Tone Flight Time Digital Delays and the trusted old MXR DDL II rack unit. David has always used delay to create a bigger sound and textures. In the 70s he preferred a Binson Echorec for its lush reverb-like character. In recent years, heâ€™s been stacking delay units set with different delay times, to replicate the sound of the Binsonâ€™s multiple heads. For the intro on Time, Davidâ€™s using both of the Flight Times and a Chrono to create that familiar slap-back echo, with the long feedback. On many of the solos, including Comfortably Numb, two delays are employed – one set for a fast slap-back to create space and one for 600ms, with 6-7 repeats. Again, as with the album, the delays are not as dominating as earlier. Theyâ€™re used with much more care and for creating a bigger tone, rather than long sustained notes. This underlines the overall sound of Davidâ€™s guitars and the production and sound of the band, allowing the guitars to cut through more easily, while also maintaing a cleaner presence. Davidâ€™s stage rig is overwhelming by the looks of it but breaking it down reveal that itâ€™s not much different from yours and mine. Itâ€™s a versatile setup, designed to cover as much ground as possible and be easy to use and maintain. Keep in mind that David and his band is covering well over 40 years worth of material and to achieve a certain authenticity, you need a few extra guitars and pedals. Not having to be concerned with flight costs and cargo space also allow for a bit more extra, in case something should break down. Rattle That Lock studio gear guide, Rattle That Lock stage gear guide, the Black Strat, Telecasters, the Big Muff tone tutorial, the Electric Mistress Flanger. Keep in mind though, in early 1971 Jimmy Page and David Gilmour had essentially the same rig, except for guitar and amp cab choice. Bjorn, where is the best location for a rotating speaker in your signal chain? Should it be before the amp like a chorus pedal or after the amp either in conjunction with a cabinet or instead of a cabinet? Thanks as always! Depends. Assuming that you’re talking about a physical cabinet, David had his after the pedalboard in a split between the Hiwatts. The rotary cabs were mixed lower to add more of a subtle chorus rather than full tremolo. As for rotary pedals, you could either place them among your modulation pedals or, at the end of the chain. Like all pedals, there are many different sounding Big Muffs. The Vick can easily be set up to sound like the 70s Big Muffs but it is one of the brighter ones. Keep in mind too that how a pedal sound, depends very much on the pickups, the amp and how you record. Different mics an placements plays a huge role. Obviously, settings and your playing technique plays a role too. It’s hard to say that THIS or THAT pedal work because of many factors and in some cases, you might be better off with something completely different. Volume control for the Mistress. Well, neither Gilmour nor Phil Taylor, his tech, has commented on it, but judging by the nature of the Lehle, its placement and the fact that the Mistress do have a volume drop, I would say that it’s most likely a volume control or a mixer for the effect, allowing David to blend it with the Muff, but I’m thinking it’s a master volume. Absolutely fantastic article love your site. One comment about David’s set up. For me if he used different and better amps he would not need all these tube drivers and gain pedals. I like the Cali76 as you can mix the wet and dry compression and I note he has one in the studio set up. For me the Hiwatt is ok, but I scrapped my Carlsboro and Hiwatt in the 80s as there are more interesting amps like Dr Z. I also note a lot of star guitarist are going back to the ressued Fender Tweed 57. I think modulation is pretty much as is. I use Strymon having ditched the Free the tone as it just sounds better. Providence to me is not great either, I use a flashback 2290 setting to mix with the timeline. Although with dual delay I can do slap back and long delay in one set up. 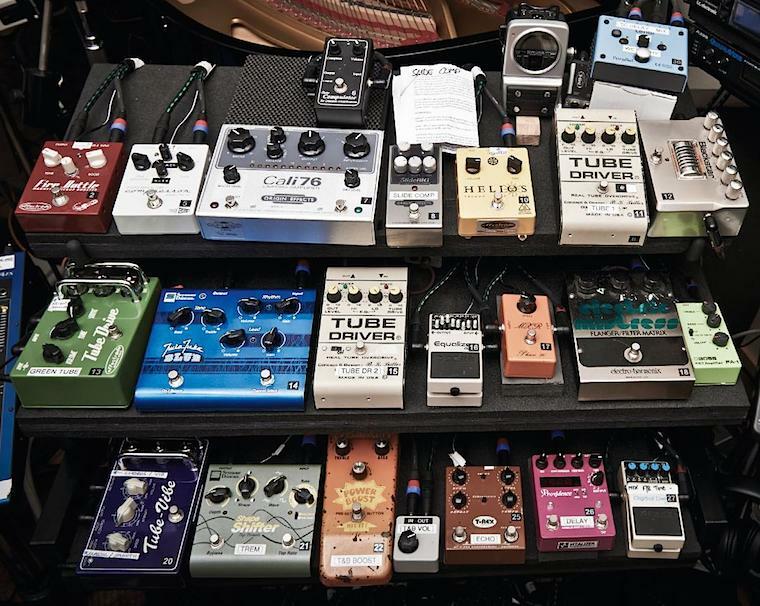 Be interested to know what alternatives to these very expensive pedals could be eliminated by using a better amp! I follow Pete Thorn who does some stereo multi channel control with a Line 6 Helix and then modifies his tone using IRs and load boxes. Different approach, but wow he gets an awesome sound. Thanks for the comment! I think David’s use of compression is a combination of many things. He’s never used subtle compression. It’s always been a part of his tone, since the mid 70s and while compression is often used to enhance a tone, David’s using it more as a gain pedal, increasing the attack and sustain. You can get some of that effect with other amps, that has less headroom and more tube compression but it wouldn’t be quite the same. Excellent information! I saw David in Chicago on April 8, 2016, and it was the best show I’ve ever seen. His tone and playing were beautiful. Hi, love the website it’s so cool! I did notice the Cali 76 comp. 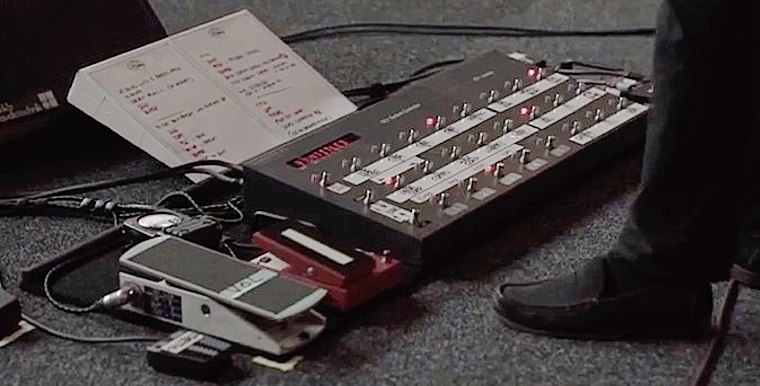 on David’s board has two extra knobs L and R on bottom of pedal in the pic. The Cali 76 I see for sale do not have those knobs. Just wondering what they are. Thank You this site is great. He used the SlideRIG Compact Deluxe but replaced this recently with the Cali76 Compact. Haven’t seen any other models. Do ytou have pics? Honorable mention of the Leslie G37 cab in the studio rig. I had a custom G27 cab made to replace the stock mdf (particle board) one. David is welcome to take it for a spin (pun intended) ANY TIME. Your best article ever! Thank you so much for your hard work. I also found your reviews of the Vick Audio V-2 and Boonar very helpful. I’m seeing all 3 shows in Chicago! WooHoo! Thank you Sean! Enjoy the shows! Just saw David at the Hollywood Bowl on Friday — and being that it was my first time seeing him live, it was a surreal experience. So you mention him using slapback echo on Time and Comfortably Numb, but what value in milliseconds do you think he is using? Seems like slapback can be anywhere from 1 ms to 100 ms but the differences between these are huuuge. Any ideas? I haven’t seen any specific settings but I would imagine that the slap-back is around 100-120 or around that range. Its a slap-bakc but with enough definition to take it out of that slight reverb-ish character. Great article and insight into one of the greatest guitarist of our time! I’ve been a huge Gilmour fan since I was 13 years old and from listening to your own solo work and Airbag that David has been a considerable influence on your tone as well. Looking forward to the new Airbag album!! Thanks for all your hard work on gilmourish.com !! Cheers! Gary D.
Thanks a lot for your kind words, Gary! I’m a big fan of how David uses compression and I love that pop you hear in the attack like he mentions in 5 am but also in Shine on You Crazy Diamond I just love that percussive attack! This is a great article, very detailed as always; your point about the solo for Time is particularly interesting. I don’t have a problem with Gilmour’s tone on 5 A.M (I think the compression works well there but there certainly is an awful lot of it), but Time does certainly seem to suffer, especially in the Oberhausen gig if you happen to have seen that bootleg. However, there is one performance at the Royal Albert Hall (I couldn’t tell you which) where does seem to be using a fuzz (albeit a very low-dialled one) that works much better; I couldn’t tell you off of the top of my head whether or not this change stuck for the South American tour, but perhaps he has rectified this! I saw all three nights at Albert Hall and I think the solo on the second night was fairly better but day one and three was horrible. I don’t think he used a fuzz though but perhaps one of the heavier Tube Drivers, stacked them or more compression… I don’t know. Would you know to say what is the pedals effect that David uses when he plays the Jedson steel guitar? Thanks! It’s usually a compressor, Tube Driver and delay. Hi Born, great article. You wrote David is stacking delay’s with different settings to simulate the Binson Echorec. Has Dave tried the Catalinbread Echorec? I have this pedal and it’s really awesome sounding. I have no idea. I’ve never seen him use one but I doubt it. He still has his old Binson. Hey Bjorn, great article as always. Thanks for being so thorough! It is much appreciated. I’m guessing most of those picks are the Herco Flex Nylon .75’s, any idea what the tear drop shaped ones are? Do you think it would be possible to get these bright aggressive live tones with EMG dg20s? I was thinking about trying to get something similar to some of those overdrive tones. I recorded our second album using mainly the DG20s and I also used them on the following tour to get a fatter and more aggressive tone while maintaining that Strat character. They do sound more compressed and warmer compared to vintage style single coils but also hotter and if you find the right balance between the SPC and EXG, you can produce some really hot hum bucker tones. Ok cool! Thank you. I was mainly going for rattle that lock solo tone and I assumed it would be best to use vintage pickups but my dg-20 pulled it off pretty well actually. I think I’ll do an experiment between my black strat and EMG strat and see which I like the best. One thing I did notice is my vintage pickups had more daynamics I guess? Yes, they will sound more organic, I guess, and respond better to your picking and the amp. Your opinion isnÂ´t “very humble” and never was! Far from it, itÂ´s very appreciated! Awesome review and great research Bjorn. Thank you for your hard work as always! I was hoping a praying he would have at least brought an RA-200 along for the tour. If not that then maybe a doppla? Maybe he will start to when he comes to North America but I highly doubt it. His sound is incredible but I can’t help but wonder how awesome it’d be with some rotary mixed in there! At least we got the mistress back though, I’ll be honest I never in a million years thought that would happen. Rotary amps, and the way David’s using them, does add a chorusy, slightly modulated tone so I don’t think he would have sounded as edgy and aggressive if he’d indeed been using rotary this time. I would have loved to hear it but it would have sounded very different. That’s right he did say he wanted an aggressive tone didn’t he? What has he been using for the lead on “in any tongue” ? Is that a muff? Sounds very much like the ram’s head. I would assume, based in the period the mod was done and the tone, that the neck is a late 60s or early 70s -ish pickup. It appear to have a tone close to the Fender CS69, with scooped mids and a clear top. As far as I know, the bridge is original or at least, not modified by David after he got the guitar from Seymour Duncan in the mid 70s. So has David got rid of that ridiculous Cornish all-tube buffer pedal board? No, he used the 2006 board for the I’m with the Banned appearance in October. I’m sure he still has all the boards from 1976 and up in his collection. Thanks for your hard work, and thanks for sharing! Can you verify which alessandro amps those are? Also, in the picture with the alessandros above the hiwatts, why does it appear that the heads are split somehow? Am I missing something? Yeah, great review. I can’t wait to see how he has progressed in April, then I will have seen him in RAH and MSG! Cheers! Any Ideas on what pedals he used with his lap steel on the Pulse tour? Any info you could provide would be greatly appreciated! Check out this detailed run down of all the effects used for each song. The list is based on pictures of David’s switching system from that tour. Thanks greatly for the response. I suppose I should have said the live pulse tour. His run in “One of these days” Is inspiring. Love the sound. Since money is limited I am considering buying the buffalo FX evolution and some reverb. You feel I should get somewhat close with this set up? Anything else you might recommend? The Evolution is great and will cover lots of ground. I recommend getting a delay over reverb. Check out this feature for some tips. In Brasil David introduced a Big Muff Civil War but. 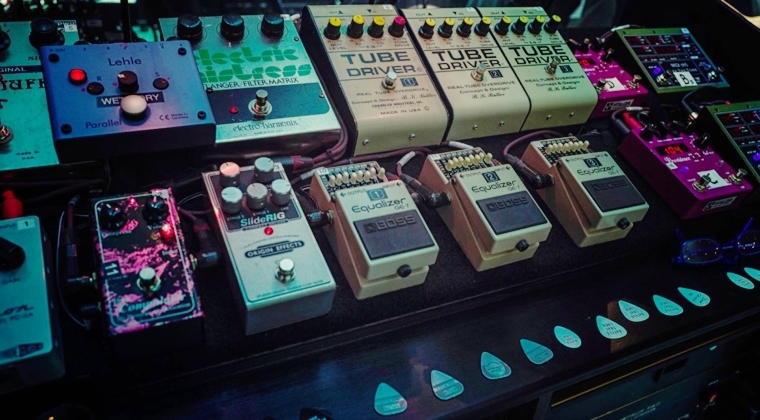 which is the pedal under the Boss GE-7 put to the right at the Big Muff? It’s a Source Audio Programmable EQ. The details you have pulled from your investigation is impressive to say the least, and your analysis is impeccable as always. Much appreciated! Great job, and keep it coming! Excellent and insightful article as always, Bjorn. Have you come around to the album at all? Thanks! I like bits and pieces and I think In Any Tongue, especially after hearing it live, is among his best solo efforts. Very informative as usual…lots of food for thought here.I recently got a 32 channel midi switching system but only 8 sends a d returns so I have to decide more carefully how to set up my pedals and possibly stacking pedals for specific tones. So plenty to be experimenting with during these dark wet days…many thanks Bjorn. I was in the last show of the south american leg of the Tour in Chile and the sound was really fantastic. Very straight and fairly recognizable in terms of which effect he uses in the songs as the show develops. It was a master class of how to use and not abuse of Delay, with just the right amount of feedback and mix (except Run Like Hell obviously). I was really surprised of the sound in both Comfortably Numb solos with the return of the chorus effect producing a very early 80’s sound. Which Chorus effect is that? Awesome investigative reporting! I wondered what you were up to since the Muffeletta posting in October and you certainly weren’t slacking off. Nice job and happy 2016 everyone!! Comprehensive and spot on as always Bjorn. Astonishing article Bjorn, as always!! When you say that Dave did not stack his Big Muff with the Tube Drivers, is it from what you’ve heard in london or did you get his presets list from Phil? I actually have the same question for your Pulse Settings. I listen Pink Floyd since 1978, I saw David in Verona this tour and Venezia in On An Island tour and 2 times Pink Floyd at the end of ’80 and ’94 tour … my modest opinion is that David had ever a great tone and sound, but if I have to select the best, my modest opinion is that the first solo album and Rattle That Lock are the best for tone and sound, less effects and more David’s touch, in particular Rattle That Lock yuo can hear the real touch of the Maestro and how is fun for him to play, some solos are pure joy, like a happy jam … sorry for my bad English …Have a great time and compliment for this fantastic site !!! Hope that all is well for you so far this year. I found one pic of his current tour switcher with hand written labels that are illegible. This was the one at the top of this page. Can you post some pics or screenshots (or links to footage) that show this level of detail? It would be most interesting to see first hand. Check out his YouTube channel and watch the video for Today and the rehearsal footage. Other sources are also bits and pieces gathered over the years from various shows so it would take too long to go into detail here. Mind that every setting I’ve listed on this site is based on specific settings seen at one specific night. David constantly change things, he always have, and although most adjustments aren’t huge, one setting might not apply for a full tour and certainly not over several tours.